After being badly damaged by transformation, the facade of 473 Nanjing Xi Lu found back some of its old grandeur when Deda restaurant took this spot. Although operating in this location since only 2007, Deda is a Shanghai landmark. 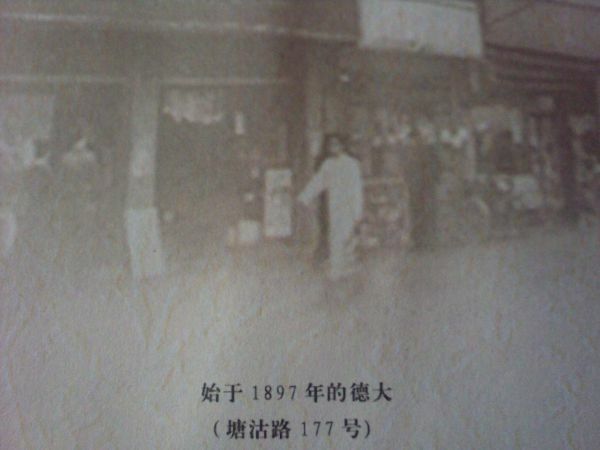 Originally opened in 1897 on 177 Tang Gu Lu in Hongkou district, the restaurant has survived through all the turmoils of Shanghai history. The most well known one was surely the previous one on 359 SiChuan Bei lu, where the restaurant relocated in 1949. The International Settlement and the French Concession had many restaurants, bakeries and coffee houses (See post ‘First Russian bakery and Tkachenko‘ ). Many of them were operated by foreigners, in particular Russians. As a matter of fact today’s Deda menu still has Borsch soup and potato salad coming with all set menus as well as a lot of deep fried dishes often found on the menu in Eastern Europe restaurants. The most amazing is not that the restaurant was opened such a long time ago, but that it has survived all the turmoils of Shanghai history since 1949. For generations of Shanghainese, Deda was a symbol of foreign culture and influence in the city. Although today’s menu does not compare with fancy new foreign restaurants, price is also much lower with lunch menus around 35 RMB. Today’s Deda main location on Nanjing Xi Lu is not an original old restaurant, but the renovation and design gives it a strong history feeling. Inspiration came more from early 1900 neo classic than 1930’s art deco but the whole atmosphere gets it right. 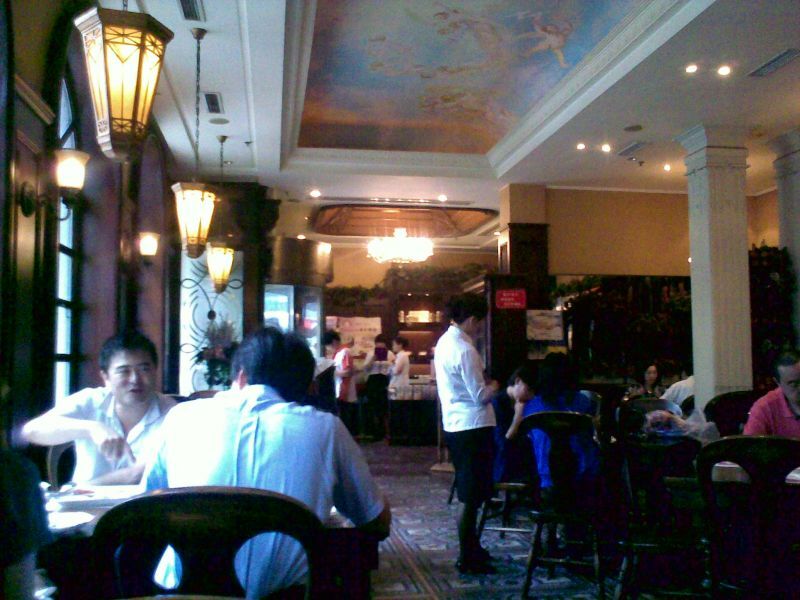 Most patrons are Shanghainese regulars coming for nostalgia. Frozen through time Deda is like a re-interpretation of old Shanghai, on the Chinese side. There is a clear western influence but Chinese taste has also slipped through it, like the fried rice served with most dishes. The restaurant also includes a cake shop, another proof of survival of foreign cooking culture in Shanghai. The recipes have traveled through time, creating a mix of Central European sponge cakes and French tarts. Although quality is not on par with new stars of French patisserie like Paul price is also unbeatable with a slice of cake costing less than 5 RMB. Seating in the coffee house by the window on Nanjing Xi Lu, I can also feel the vibrations of the metro line just below… just like similar vibrations of the tramway lines that used to run the same street in the 1930’s. Coffee drinking in Shanghai and coffee houses have a long tradition (see post ‘Shanghai Coffee Culture‘ on the topic) and sitting in Deda reminds me of coffee houses in Prague, Budapest or other cities in Central Europe. With its mix of Western influence and Shanghainese patrons Deda is just like a picture of Shanghai, a great mix of western and Chinese, modern and old at the same time, a true Shanghai institution. Well done, Deda! Time will tarnish us all but a true test of the steel quality within us is not to let it gone, for carrying all things forward like Deda and Shanghainese culture is our responsibility!